„What do machines sing of?“ is a fully automated machine, which endlessly sings number-one ballads from the 1990s. 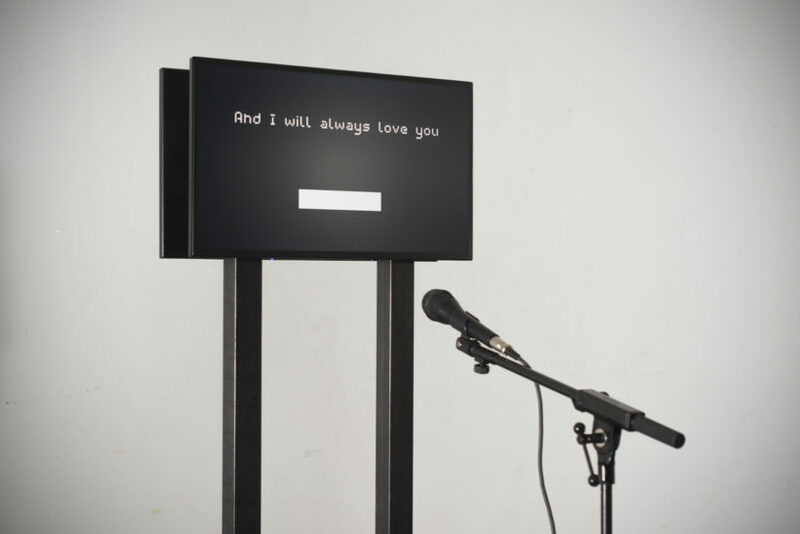 As the computer program performs these emotionally loaded songs, it attempts to apply the appropriate human sentiments. This behavior of the device seems to reflect a desire, on the part of the machine, to become sophisticated enough to have its very own personality. I also uploaded the video to YouTube. You will find here. A big thanks goes to Prof. Dr. Alberto de Campo, Hannes Hölzl, Prof. Joachim Sauter and Fredrik Olofsson (Art and Media Departement, University of Arts Berlin) for inspirational thoughts, lots of help and of course very good programming advices. A big thanks goes also to everyone involved in this project, but especially to some good friends, namely Markus Lerner for helping me out shooting the documentation video, Till Nagel and Brendan Howell for thoughts and translation. The work has been created at the University of Arts in Berlin (Art and Media Departement) with the environment and programming language SuperCollider.